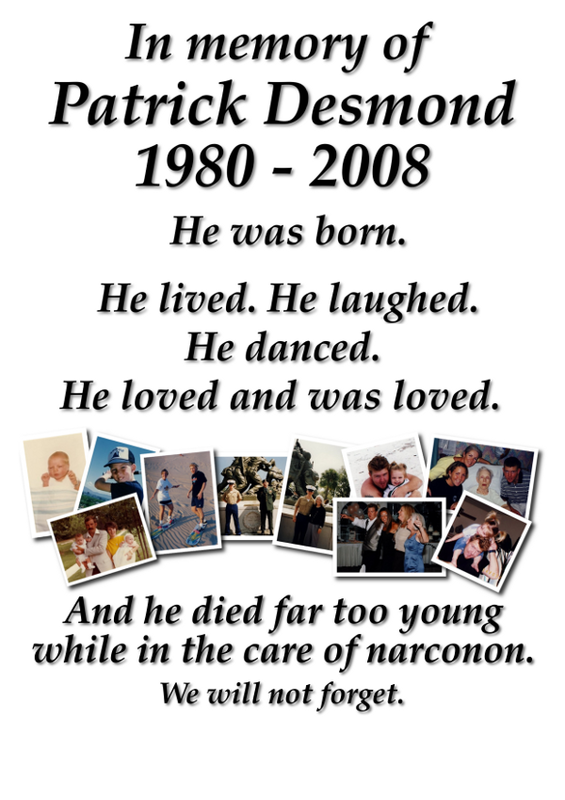 As the result of a 2007 DUI, Patrick was mandated to residential treatment by a drug court in Brevard County, Florida. His family researched drug treatment options on the internet, found Narconon and contacted Narconon of Georgia, for more information. Allegedly, Narconon staff members including the Executive Director, Mary Rieser, represented Narconon of Georgia to the Desmond family and to the Drug Court Manager, Lisa Mooty, as a residential treatment program that provided monitoring of clients at all times. In fact, Narconon of Georgia is licensed only to operate as an outpatient drug treatment program and is specifically restricted to providing treatment in a non-residential setting. Critics kept Patrick's memory alive with candlelight vigils, until they discovered that a personal injury and wrongful death civil suit had been filed in DeKalb County. The lawsuit alleges that Patrick was allowed to leave poorly supervised, off-campus housing, introduced to heroin for the first time and ultimately overdosed resulting in his death. Patrick's family and friends loved him dearly. As we wait for the conclusion of this case, we hope, as they do, for justice to be done. The list of court documents follows, but first I would like to ask anyone who has any information that may be useful in this case to please post it here in this thread, so it can be easily found. INC., LISA CAROLINA ROBBINS, M.D. Plaintiff's Brief in Support of Sanctions: Mary Rieser's attorney acting like an idiot everytime Mary opens her mouth and says what her lawyer does not want her to say, lol! Thanks for the gap-filling, I'll continue to monitor too over at WPP thread, here. Thanks, tikk. You may find Mary Rieser's deposition of interest. I believe it is Exhibit E.
Great to see you here, tikk. Did you notice that Helena Kobrin was at Mary Rieser's depo? 3 to you, and I'll try to get funding." 12 Judge Riley's first name? Lord! Mary Rieser got most of her rehab knowledge and training @ the Chilloco Oklahoma NarCONon facility? When I filmed there it was never ever presented as a training center. It was presented as part of the Church of Scientology. It at that time was an inpatient treatment facility fully funded and supported by the Church of Scientology. All printed material were made by the church. All staff were from the church. All e-meters were provided by the church etc,etc. Yes, Auditing was done on the clients. Guess what happened to the Chilloco Oklahoma narCONon facility? It is CLOSED for failure to deliver promised services among other things. WOW! All you work so very hard on all of this; indeed an in spriration. My lawyer will love to see all this. Thanks EC, you deserve a goldenrod for this. Sanctions against Narconon's lawyer ok'd by the Judge. I can not seem to find where the Dekalb co judge ok,d the sanctions against the defendants lawyer. Could someone please steer me in that direction if this is the case? Thanks. There was a motions hearing on Aug. 4. I was not there, so I don't know exactly what happened. I surmise that the sanctions were granted from the "cult whining" letter and from the fact that there is a new notice to take video deposition of Mary Rieser and an order on the docket requiring Narconon to pay for Mary Rieser's first deposition (which were both requested in the Motion for Sanctions - a second depo and that Narconon pay for the first). Also, the issuance of the Standing Order and Instructions to Counsel telling them how to behave in depositions would support that idea. I don't know whether it is required to enter a document for rulings made in court, perhaps someone else knows. I feel pretty certain if it were required, there would be one. Also, one note for accuracy - this is not a Dekalb Co. judge, it is a State of Georgia judge in Dekalb Co. I went through it some but it's a bit confusing because it's missing lots of pages. Not sure how much can really be discerned from what's there except her lawyers didn't want her answering anything. Whenever there's an order for a second deposition + a video requirement, it means the first deposition was not only disastrous, but there was more going on than what can be inferred from the transcript. It means there's some intangible aspects the plaintiffs want to be able to convey to the judge. The plaintiffs filed the entire Mary Rieser depo with their Brief (4 to a page), and then Narconon filed pieces of it with their Brief in Opposition (1 page at a time). I believe all of the depositions have been scheduled as video depositions. I would love to see the videos. Thanks, skydog. Free deserves a round of applause too, though, because she helped me keep all the papers in order while I scanned. Great! I hope he can put it all to good use. I nominate Free for a goldenrod too. There is a picture of Mary Reiser, ED of Narconon on their facebook page. She is the first lady on the right in the blue dress. SkyDog. Pictures of all the players can be found @ the following link. he one picture of Maria Delgado was taken @ a Sandy Springs zoning meeting. What a sad story. I still recall their (out of thin air) estimate that 90% of their clients are cured, and am with holding my ugly comments, other than to say that I do not know scientologist that could pass a statistics course.